In May 2017, the Lanzerac Hotel and Spa made the front-page of several newspapers; the story was not good. It was tragic. The 326-year-old estate was razed by a fire that swept through the main operating areas of the hotel. Pictures of the extensive damage circulated, tourists and locals who had visited the property poured their hearts and memories out online and wished the grand dame a speedy rebirth. Every new brick laid down was a symbol of hope. A sign of better things to come and the determination to restore the hotel to its former glory. 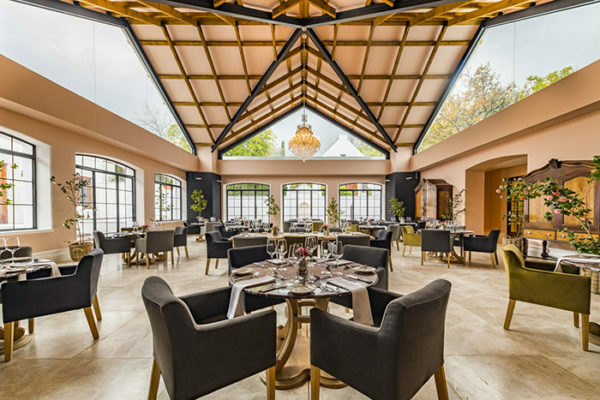 Rising from the ashes, a year later, Lanzerac has been transformed into an elegant, breath-taking oasis, which has exceeded expectations and risen above its days of yesteryear. 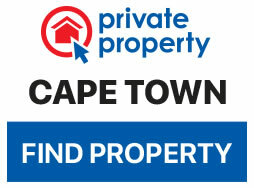 The tree-lined driveway delivers you to the Manor House built in 1830, in the distinctive Cape Dutch style. The Governor’s Hall is a reminder of why Lanzerac Hotel and Spa is a five-star establishment. High ceilings, crackling fireplaces and exquisite art displayed in every corner of the hall give you a taste of the estate’s rich history. The Taphuis bar stands in the original building and boasts about the Lanzerac’s history with historical photographs and memorabilia. 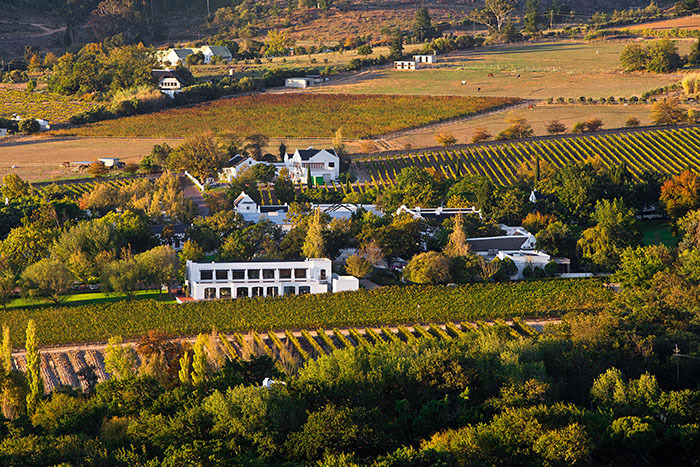 The estate, in the Jonkershoek Valley outside Stellenbosch, dates back to 1692 when it started as a homestead. The estate’s most influential owner, Elizabeth Catherina ‘Kitty’ English in 1920 changed its name to Lanzerac, rumoured to be after General Charles Lanrezac – a French General who served in World War I.
Lanzerac changed owners a few more times until in 1958, the farm was converted into an elegant hotel and landmark by David Rawdon. 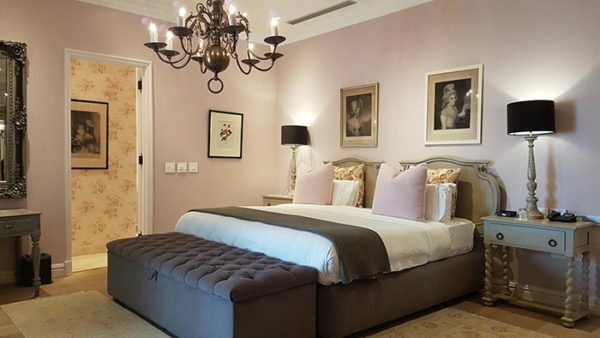 Since 2012, and under new ownership, Lanzerac has been transformed into a luxurious and modern hotel and spa, with the kind of comforts reserved for dreams. After the devastating fires of 2017 designer Con van der Colff reimagined Lanzerac and added a contemporary sophistication to the grand dame’s old school grace. The rejuvenation project is a tale in itself. The fire managed to unearth some of the hidden original walls and floors dating back to the mid-1700s. These fragments of Lanzerac’s history were embraced and restored to form part of its present-day regenesis. 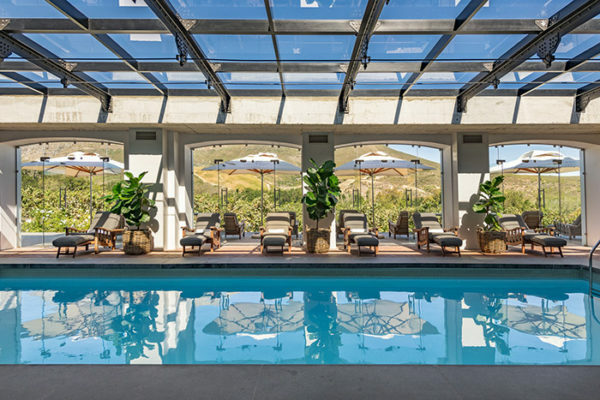 After checking in, we wandered around the estate breathing in fresh valley air, absorbing the dramatic mountain ranges, endless vineyards and immaculate lawns. A leisurely wine tasting and charcuterie board go hand-in-hand and it was a perfect way to unwind in the most tranquil surroundings. The cellar boasts an impressive array of white and red estate wines. The Shiraz proved to be my favourite. It’s a spicy, well balanced and fragrant wine that paired perfectly with the food. The bedrooms are stylishly decorated. The 53 exquisitely styled bedrooms and suites all have unique and personal detailing in warm tones and classy finishes. Our cottage was possibly the best of them all. There is ample space to make you feel like royalty. It felt big enough to raise a royal family too. The bathrooms are enormous and luxurious. You may look longingly at the massive bath tub and picture thousands of bubbles, but head straight for the shower. You won’t regret it. 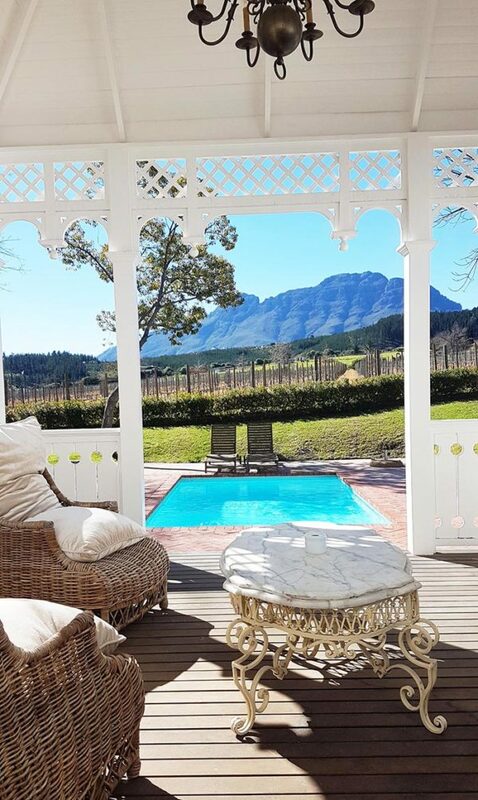 With plenty of privacy, a swimming pool and a spectacular view of the vineyards and mountains you won’t just feel at home here at Lanzerac; you will imagine this was your home. The views from the rooms. If you needed more ways to relax than sitting by the pool and working your way through the complementary mini bar, a spa treatment is highly recommended. The facilities are immaculate and inviting, with its azure heated indoor swimming and tranquil relaxation spots that gaze at the mountains. It’s a world unto itself where time stands still, and the air is filled with citrus scents, harp music and flowing water. 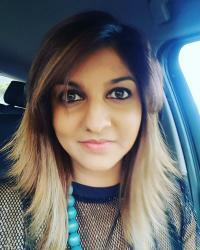 Do your soul a favour and treat yourself to a full body massage. It’s worth the price tag, and better than you’d ever expect. The staff appear to have super powers of relaxation. I left there feeling like I was walking on a cloud. The Spa at Lazerac Hotel. The eloquent Manor Kitchen is a work of art in itself. Glass chandeliers drape the room in soft light and the table settings are stunning. The restaurant will take care of your appetite. Make sure you leave enough room for the courses. The menu caters for everyone and the food doesn’t disappoint. It adds to your experience of the picturesque estate. 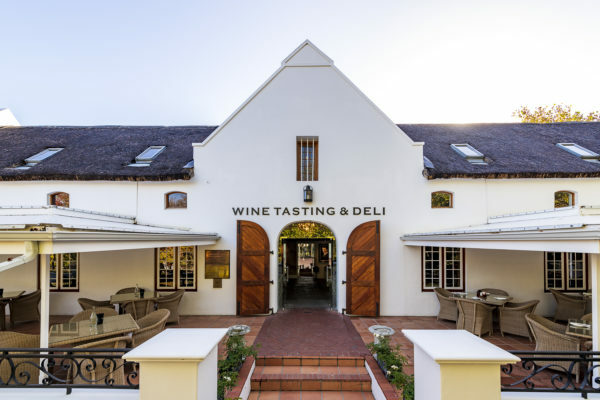 The ambience is ethereal and definitely worth the drive out to the wine lands for a special occasion if you’re a day visitor. Lanzerac brings old world charm and modern luxury together in a seamless symphony, that pleases every sense. It stays true to the vision of its former owners, but welcomes a new era of modern luxury and service.